Possibly because I had a nap yesterday afternoon, I woke up around 3 AM and dozed fitfully thereafter before giving up around 5 AM, showering, and going up to the deserted lounge where I got a tiny bit of online work done. 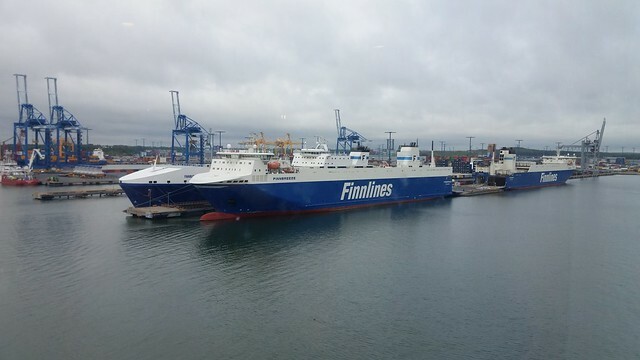 I'm surprised that Finnlines doesn't open their cafe at 6 AM on the final morning at sea. Lisa and I were among the first in the queue for the "Sea Breakfast" (a somewhat cut-down but still generous buffet) in the main restaurant that opened at 7:30 AM as the ship approached Helsinki. We watched the scenery as our ship navigated the channel markers. 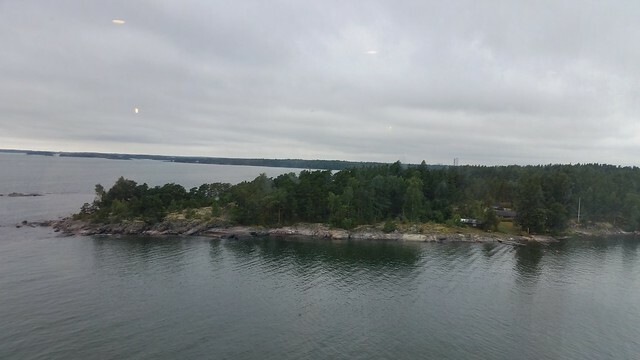 As we entered Vuosaari Harbor, we saw other Finnlines ships at anchor. We arrived about fifteen minutes early, and around 9:15, walk-on (i.e. without vehicles) passengers like us were allowed to disembark. Courtesy vans shuttled us to the terminal. Cheryl Morgan was there to meet us, with her friend Otto, who had kindly agreed to collect us and drive us to the hotel, saving us having to negotiate bus-metro-train connections with eight pieces of luggage. Cheryl also had helpfully obtained for me a SIM card for the mobile phone I had in 2014 at Loncon. At the hotel, we were very early, but the front desk was very helpful and told us that the previous occupant had checked out and that housekeeping would do our room next. We waited in the lobby and Cheryl helped me activate my mobile phone. I now have a Finnish (+358) telephone number usable for the duration of our stay here. (Write to me directly if you need the number for some reason.) We bade Cheryl and Otto goodbye, and shortly thereafter, our room was ready for us. 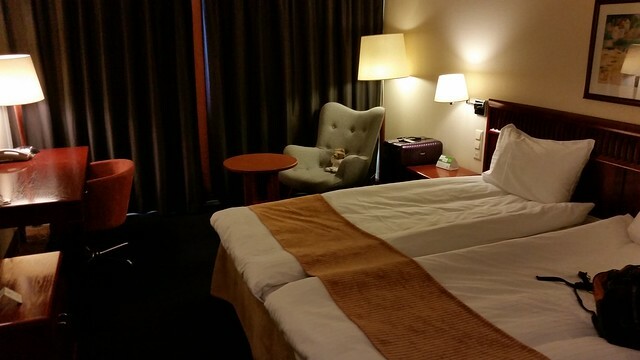 We are pleased with the hotel room. I am very pleased with the internet connection. Not only do I get upgraded premium wi-fi, but there is a wired connection in the hotel room (and I brought a cable). The speed is 12-15 mbps both download and upload, which bodes well for us getting the official Business Meeting recordings online relatively quickly. Today is not only move-in day, but also a "maintenance" day. Our plans called for us to get some laundry done. In addition, Lisa was looking for a hardware store because along the way, a screw had worked itself out of one of her pieces of luggage and she hoped to repair it. It turns out that we could get several errands done simultaneously. While we were moving in, so was rain, and it was raining heavily by the time we had our laundry bagged up and ready to go. The hotel, however, helpfully provided us with loaner umbrellas! The #9 tram stops directly across from the hotel, and because it's a terminal loop, you don't have to worry about direction: all trams are going toward downtown. We bought a pair of day passes (€9 each) and rode the tram to Fleminginkatu. That put us at the S-Market (grocery store) which has a 24 Pasula coin laundry inside. The price for the smaller washer is €6, which includes detergent (automatically dispensed). Alas, I misread the instructions and wasted six Euros because you have to set the temperature before putting in the coins, and I did it the other way around. I pressed the Stop button in time to keep it from scalding our colored wash, but when you do that, you have to start over, including putting the money in again. While the wash ran, we browsed the grocery store, including buying twelve "D" batteries, which Lisa needs for her camera kit. (We could probably get by with fewer, but she plans to use three fresh batteries for each day of the Business Meeting rather than risk running out in the middle of the meeting.) We then swapped the laundry over to dry. The price for dry is €0.20/minute (3 minute minimum). Thanks to my earlier mistake, I was running a little low on coins, but had enough for 24 minutes, which did prove sufficient. Time on the laundry was running out while Lisa browsed the hardware store, so I trotted back across the street, where to my amusement I was consulted as the expert on how the dryer worked by a first-time user. I explained that you get more time by just dropping more money in the slot, even while it's already running. While she worked on that, I noted that "I'm the one doing the laundry while my wife shops for tools and hardware across the street." Who needs traditional gender roles, anyway? After completing our errands, we returned to the hotel, where Lisa attacked her luggage and power cords to affect repairs and alterations, while I painted my fingernails. I had vowed that this would be the first Worldcon in about ten where I didn't crack a fingernail, so I used the kit I'd packed in the hold luggage (lest I be tempted to try hijacking the airplane with a nail file), trimmed my nails, and coated them with clear nail-hardening solution. So we're mostly settled in for the long haul through Worldcon and beyond. Tonight Lisa and I will be taking her friend Chris out to dinner for his birthday. Tomorrow Chris and Lisa head off to the Nuclear Power Plant tour, while I see what can be done on day -1 of Worldcon.